In June 2004, the British Columbia Green Infrastructure Partnership (GIP) released a Consultation Report which included a comprehensive definition of “green infrastructure”. Three years later, in June 2007, the first in the Beyond the Guidebook series of guidance documents provided a clear distinction between natural and engineered green infrastructure. The Beyond the Guidebook Series builds on the technical and philosophical foundation provided by Stormwater Planning: A Guidebook for British Columbia, released by the British Columbia Ministry of Environment in June 2002. The Guidebook articulated a ‘design with nature’ approach to community design. Built and Natural Environments are Connected: So, Design with Nature! The Green Infrastructure Partnership (GIP) was formed in 2003 to promote an integrated approach to land development and infrastructure servicing that addresses the need for coordinated change at different scales – that is: region, neighbourhood, site and building. The GIP was one of six elements that made up the Water Sustainability Action Plan for British Columbia, released in February 2004. The six elements holistically link water management with land use, development and resource production. “Under the umbrella of the Water Sustainability Action Plan, the GIP mission was to facilitate implementation of infrastructure practices and regulation province-wide that embody a ‘design with nature’ way-of-thinking and acting,” states Kim Stephens, a founding member of the GIP Steering Committee and currently Executive Director, the Partnership for Water Sustainability in BC. After incorporation of the Partnership for Water Sustainability in BC as a not-for-profit society in 2010, the responsibilities of the GIP were assumed by the Partnership for Water Sustainability. “In recent decades, the British Columbia landscape has been transformed by settlement and economic growth. While the province has been experiencing enhanced social and economic well-being, it has also experienced avoidable cumulative environmental impacts. The latter are due to pressures on land and water resources. “The desire to mitigate environmental impacts has provided a driver for a ‘green infrastructure’ movement that is water-centric and is founded on a natural systems approach. “Through implementation of ‘green infrastructure’ policies and practices, the desired outcome in going Beyond the Guidebook is to apply what we have learned at the site scale over the past 10 to 15 years…so that we can truly protect and/or restore stream health in urban watersheds,” concludes Kim Stephens. “Two complementary strategies can ‘green’ a community and its infrastructure: first, preserving as much as possible of the natural green infrastructure; and secondly, promoting designs that soften the footprint of development,” wrote Susan Rutherford in 2007. At the time, she represented West Coast Environmental Law (WCEL) on the GIP Steering Committee. 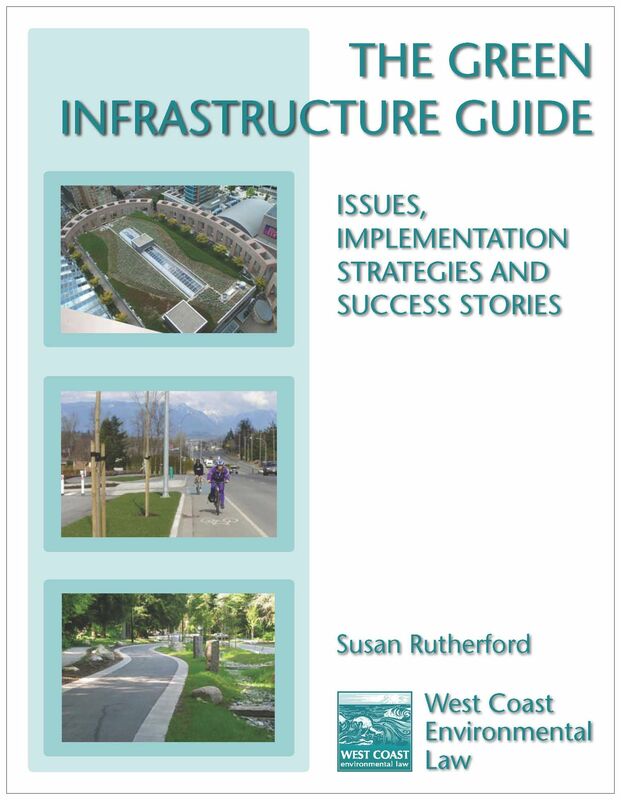 Susan Rutherford was the author of The Green Infrastructure Guide: Issues, Implementation Strategies and Success Stories, May 2007, a deliverable under the Outreach and Continuing Education Program undertaken by the Green Infrastructure Partnership. “The Green Infrastructure Guide traces some of BC’s local government experience in implementing engineered green infrastructure designs,” wrote Susan Rutherford. “The Guide’s purpose is to encourage successful designs, by reporting on what the legal and policy strategies are, what some of the implementation hurdles (and solutions) have been, and how they have been effective in achieving sustainability goals. “Using a narrow interpretation, green infrastructure refers to the ecological processes, both natural and engineered, that are the foundation for a healthy natural and built environment in communities,” wrote Deborah Curran for the GIP’s 2004 Green Consultation Report. Deborah was the original WCEL representative on the GIP Steering Committee. “Using the green infrastructure to manage common processes, such as rainwater runoff, keeps water on the land longer, thus recharging aquifers while protecting stream hydrology and morphology. “Street trees, greenways and rooftop gardens, the ‘urban forest’, help mediate summer heating in developed areas, restore pre-development levels of evapotranspiration, and sequester pollution while providing habitat for many species. “Green infrastructure in neighbourhoods, such as green streets, constructed wetlands, protected stream corridors and new greenways, are seen as amenities and increase property values. “Finally, maintaining working lands is important both for the economy and for their contribution to the green infrastructure of a region,” concluded Deborah Curran. Read the Report on the Green Infrastructure Consultation Held on May 11, 2004 in Vancouver . Read Beyond the Guidebook: Context for Rainwater Management and Green Infrastructure in British Columbia, released in June 2007. Read The Green Infrastructure Guide: Issues, Implementation Strategies and Success Stories, released in 2007.